The club were very proud to be able to take 8 of our gymnasts down to the English Championships at the weekend. 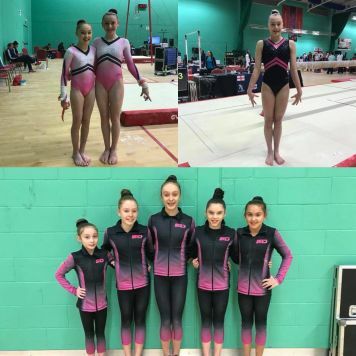 The first of our girls travelled down South to take part in podium training on Thursday where they were able to get a feel of the equipment and the competition hall where they would be competing the following day. Isobel, Ellie, Harriet, Charlotte and Mercedes competed in the Espoir competition on Friday, it was the first ever English Championships for all of the girls and although a few errors were picked up along the way the girls had a very positive experience. Leah was our only gymnast to compete in the Senior level on the Saturday where she had a good competition with only a few small mistakes but still showing off great gymnastics and doing herself and the club very proud. The final day of competition took place on Sunday with Lydia and Mia competing in the Junior level. Both girls showed off their routines well with Mia having an awesome day finishing in a fabulous 8th position all around! Well done Mia! !